Play only if you control a unique character. Interrupt: When the effects of a triggered character, location, or attachment ability would initiate, cancel those effects. This is an absolutely key card for House Lannister and can really ruin your opponent’s day! Cancel effects are rare at the moment and House Lannister gets the trump card! Given that triggered abilities are often game-winning in terms of strength, the ability to cancel is clearly invaluable. As an example of the card’s power; recently I played a very fun game against The Night’s Watch. After winning an intrigue challenge I played Tears of Lys on Old Bear Mormont. My opponent then sacrificed Bran Stark to cancel the effect. Out comes Treachery and poor Bran dies in vain along with Old Bear Mormont! Of course there are a multitude of nasty cancels in line with the above. Make sure you know your opponent’s faction and save this card for the really powerful effects, for maximum morale destruction! The only downside of Treachery seems to be that it does not cover plot effects or events. But hey, no card can be perfect! Treachery can cancel Forced Reactions on characters, locations, and attachments, as Forced reactions are still triggered abilities. For example, it's perfectly legal to cancel The Hound, Ser Jorah Mormont, or The Wall. When an effect is cancelled, the cost is still paid. So if Treachery cancels Ice for example, Ice is still sacrificed. If Treachery cancels Varys, he is still removed from the game, etc. An interrupt (like Treachery) resolves before its triggering condition does (That's why a card like Viserys (Core) can trigger - because his interrupt happens before he's actually killed). For example, when Winterfell is triggered but before it resolves, it is interrupted by Treachery. Treachery cancels it, so it never resolves. When a player wishes to marshal or play a card, or initiate a triggered ability, follow the steps on page 10 of the RRG. 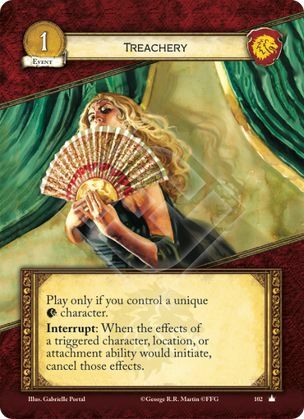 Eligible targets for abilities like Arianne and Queen of Thorns are revealed in step 1, before the decision to cancel with Treachery is made in step 6.